Selected for the Society of Animal Artists 2014/2015 Art and the Animal exhibition and national tour. I was at a horse show when I took photos of this gorgeous Saluki. He was in a building near a door with the glow of bright daylight stroking across his body. That’s what gave me the idea to place him inside a tent with the desert outside. 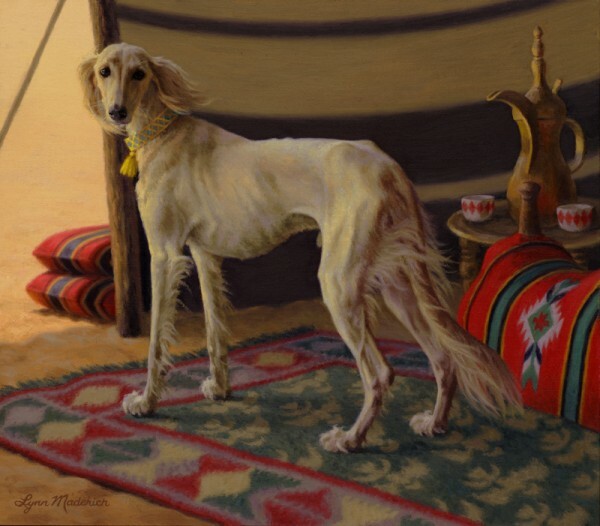 I painted him from my photo reference but the tent interior was designed using my research into Bedouin weavings and tent furnishings.